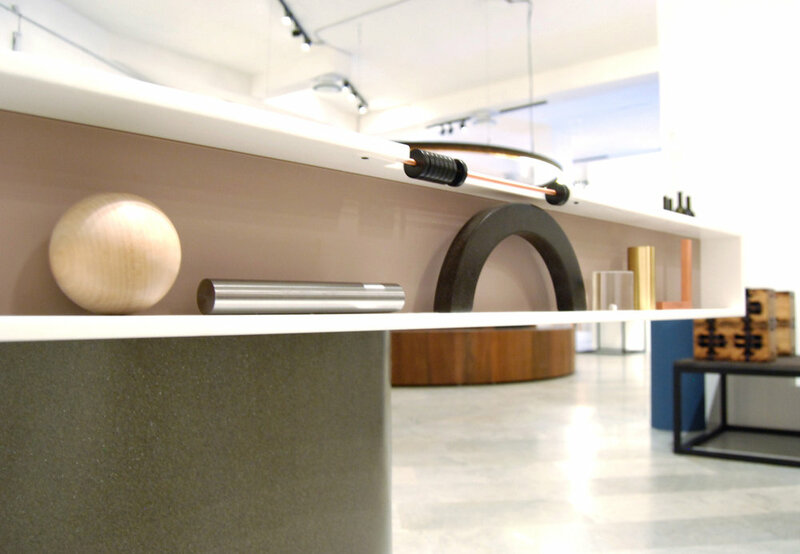 Wallpaper* Handmade invited our studio to design a bespoke air hockey table to aligned with show theme: food, drink, and entertainment. Our conceptual starting point was a mental image of 12-year-old boys furiously playing air hockey in a loud arcade...then asking ourselves 'How can we turn this into a more elegant game but still keep it fun?' The answer lay in simple form factor tweaks and employing a sophisticated material palette of Corian, warm metals, and maple. This elevated treatment was paired with a new gaming approach, adding playful obstacles and angular scoring ports to make the game more challenging and strategic. Each obstacle shape can rearranged or stowed away on the side of the table to change the dynamic of the playing surface. The finished piece debuted at HANDMADE Wallpaper* exhibit in Milan during Salone de Mobile show in April of 2015.